McCain’s counterpart in the Senate, Jeff Flake (R-Ariz.), also criticized Trump’s decision to pardon Arpaio on Friday. "Regarding the Arpaio pardon, I would have preferred that the President honor the judicial process and let it take its course," Flake wrote on Twitter. Indeed, as McCain acknowledges, the power of the President to pardon anyone for any reason is absolute. It cannot undermine the rule of law for the Constitution trumps, no pun intended, all laws. One can indeed argue that the judge’s order Arpaio is said to have criminally violated is no more valid or soundly rooted in the law than the rulings that initially blocked President Trump’s temporary travel ban. Sen. McCain's ignorance of the Constitution is surprising. Presidential pardons cannot, by definition, undermine the rule of law, nor respect for it. The Founders conferred an absolute right in a President to pardon any person for any offense. Trump exercised this right, just as every President before him has done. But under McCain's standard, all pardons would undermine the rule of law. 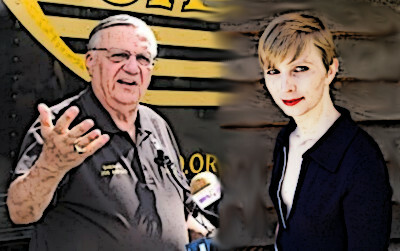 Obama pardoned General James Cartwright and commuted the sentence of Chelsea Manning. The President had the right to do so. The administration that refused to enforce voting rights law in the New Black Panther case is going after America's best-known sheriff for what it calls discriminatory policing practices involving Hispanics…. With a thoroughness not seen in Justice's handling of the "Fast and Furious" federal gun-running debacle that resulted in the murder of Border Patrol agent Brian Terry a year ago, Assistant Attorney General Thomas E. Perez, head of the department's Civil Rights Division, listed Arpaio's alleged excesses and said a three-year civil investigation found that the sheriff and his deputies engaged in unconstitutional conduct and violations of federal law that jeopardized his "commitment to fair and effective" law enforcement…. No doubt Arpaio has been under scrutiny for some time. But the timing of the announcement is curious, not only because of the announced Supreme Court review of SB1070, but also because it can be seen as another attempt to rally the president's Hispanic base as we enter an election year, and to portray border security advocates as racist and anti-Latino. If the name Thomas Perez sounds familiar, it should: Perez was heavily involved in the decision to drop the voter intimidation case against members of the New Black Panther Party. Perez testified before the U.S. Civil Rights Commission that "the facts did not constitute a prosecutable violation of the federal criminal civil rights statutes." Homeland Security Secretary Janet Napolitano quickly piled on. "Discrimination undermines law enforcement and erodes the public trust," she said. "DHS will not be a party to such practices. DHS has memoranda of agreement (MOAs) with around 70 state and local law enforcement agencies to participate in 287(g) partnerships to enforce federal law. Under the 287(g) program, Arpaio's deputies could question jail inmates about their immigration status. What makes this case interesting, as the Washington Examiner's Byron York has reported, is that in September 2008, nine months before DOJ first informed Arpaio of its investigation, Immigration and Customs Enforcement (ICE) conducted its own investigation of Arpaio's office and procedures and found nothing inappropriate or illegal. Perhaps if Arpaio had given away the nation’s secrets, or been an international felon like the Clinton-pardoned Marc Rich, or been a New Black Panther intimidating Philadelphia voters in 2008, McCain, Flake, and Ryan might have a case. But they don’t. Joe Arpaio was and is a patriot fighting to protect our nation’s borders from invasion and was acting in good faith in enforcing federal lawas it was originally written, not as reinterpreted by a liberal judge. McCain's professional and personal behavior leaves him without any position he can condemn or criticize anyone on. The man is a coward and bereft of personal integrity. I do not understand how such a corrupt and loathsome character could have attained his position. As for Flake, he is younger than McCain so I am sure he has time to attain the same achievements of the senior senator. I still remember dishonest McCain when he was in on the Lincoln Savings & Loan scandal. Is Sheriff Joe Arpaio really as likely as Obama's pardons to commit felonies again?